Ask a roomful of small-firm lawyers about KPIs, and I’d be willing to bet a good number of them would have no idea what you are talking about. Kitchen patrol in the infantry, maybe? Another group would know about KPIs, but consider them relevant only to large firms or other types of businesses. And then there would be those who actually use KPIs in their firms. Odd are good that the lawyers in that last group are among the most successful in the room. 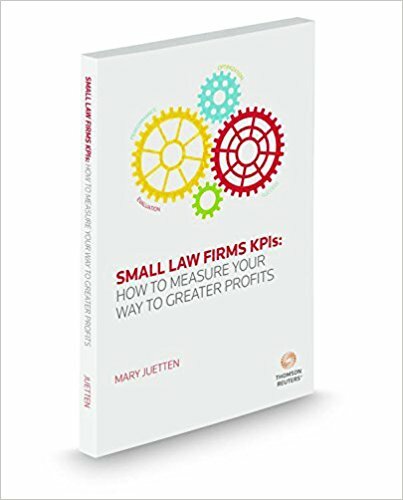 In her new book, Small Law Firm KPIs: How to Measure Your Way to Greater Profits, Mary Juetten makes the case for why all small firms should use key performance indicators. KPIs equip you with the knowledge you need to make informed business decisions for your practice and deliver the best value for your clients, she argues. Juetten is the founder and CEO of Traklight, a platform that helps businesses protect intangible assets, and co-founder of Evolve Law, a company that promotes innovation in legal technology. Before attending law school, she was an accountant, consultant and business executive. In separate chapters, Juetten covers each of these areas in depth, illustrating each using examples of different types of law firms, such as a solo family law attorney, a two-lawyer personal injury firm and a 20-attorney business and commercial litigation firm. For each area, she discusses just a few key “starter” KPIs to track, providing more detailed lists in appendices at the end of the book. She explains why each of these areas of measurement is important, describes the data to measure and potential sources of that data, and then walks through a detailed example of a firm’s use of these KPIs and how they led to improvements in the firm’s business. Each chapter also includes recommendations of specific technology law firms can use to assist with gathering and measuring KPI data. You need no advance familiarity with KPIs to get benefit out of this book. Juetten explains their use in clear language and she provides a glossary defining key terms. She also starts the book with a brief overview of basic accounting and budgeting concepts. Small Law Firm KPIs is published in paperback by Thomson Reuters. It can be purchased for $85 from Thomson Reuters or from Amazon.